"Hey, this is not a dream: YOU ARE IN EUROPE, YOU ARE LIVING IN LISBON!" My life is a real-life movie, and I got to sit, be inspired, and live here for 2 months, and do all the touristy things. 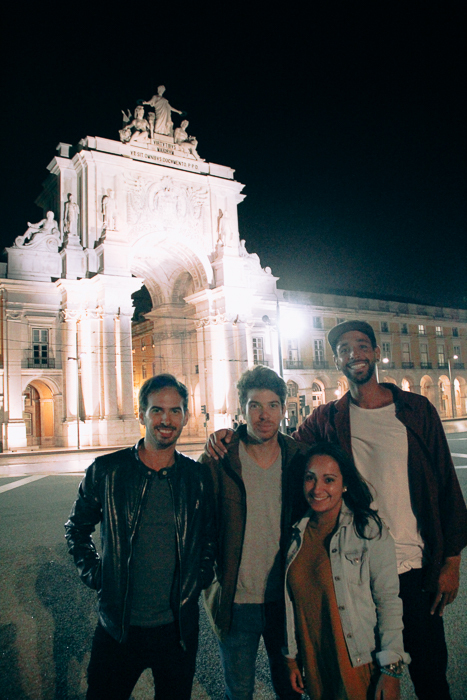 Let me show you a little bit about the Lisbon I've enjoyed. This downtown neighborhood is one of the most touristy spots in the city, but I love it. It hosts all the shops, a famous elevator, its located on a hill and there are many places to see. The reason why I love it, is because it has tiny streets. While I live quite far, there is a convenient metro stop right in the city in order to go to one of my favorite spots. Tourists shopping. This lady reminded me of my grandmother. My main destination is Portas do Sol, but before getting there I must walk through the streets of the center, go through several plazas, maybe grab a coffee. As I exit the subway I notice all the metro art. 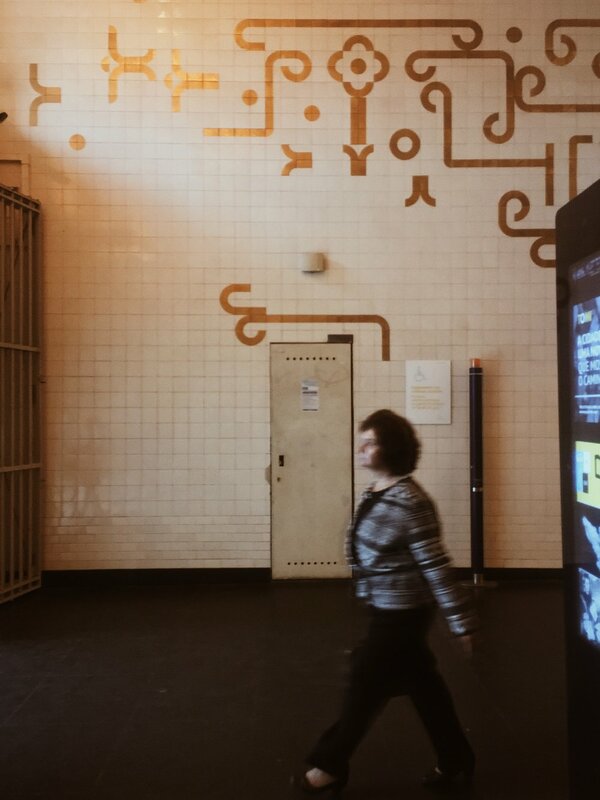 Baixa-Chiado, the station, is covered in white tile, decorated with gold accents. I step out of the escalator and I'm there. If I turn right, I see one of my art stores; where I buy the paper for my new collection. If I go straight for 2 or 3 minutes I'll find a little coffee shop that I love, Otra Face de la Lua. Like all cafes and restaurants, it has a little patio area in the middle of the street. I love it. It is so hard for me to choose which direction I'm going to face every time I'm there. I ask for a meia leite (usually less than 2 euros) proceed to journal/work and then about my day. Before leaving, I go inside to look at the things they sell: It's a vintage thrift store and it smells old. It's a lovely spot. Otra Face de la Lua. People watching at Otra Face de la Lua. He saw me taking his picture, and knew exactly how to make it better. Side note: it is not normal for people to drink coffee with milk past the morning hours. Everytime I order a latte or meia leite or galao they look at me funny, but it is what I want and I don't mind. The Portuguese are passionate about un cafezihno or descafeinado (an espresso shot, usually decaffenaited in the afternoon). I begin my 10 minute walk up a giant hill to get to Portas do Sol. As I walk there I go by Igreja de Santiago. It has a beautiful façade, but every time I'm there is a lady begging. This made me starte noticing the sad reality that there are many homeless people in the city: it is the major form of poverty in the city. A lovely reminder of San Fransisco, also a tourist trap. One Friday night I was on my way to the view point Portas do Sol, and I noticed all of the homeless gathering. While I was glad they were getting food for the night, I was reminded once more of the world's reality and the poverty that exists. I am however glad, that there are people everywhere choosing to take action and serve others. Lisbon also hosts the oldest operating book store in the world (not this one pictured). People love to read, and I rarely see them on ipads. Unfortunately, most of the book stores only carry books in Portuguese. I keep walking up the road and get to one of the first view points, here there will usually be some street music, but it's not quite as good as Portas Do Sol. Two minutes later, I'm there, Portas Do Sol (also the view on the cover image). I've done this walk many times. My favorite time to go is right before the sun sets because I can see the river and the homes in the sunlight, but I also love the reflection the stars cast at night. THEY LOVE COD FISH. Portugal is the highest consumer of cod fish in the world! They even import it from Norway and the Scandinavian countries because they don't have enough here) . The sunset/night is tranquil and calming. A place that looks like a scene from a movie, so I am in no rush to get going. I think it is something about the white walls and the fact that I can see the Rio Tejo, Ponte 25 de Abril and the other side (Almada) in one setting. I also see the tiny streets below me, and when the night hits I can see the start, the moon and the clouds. It is quite a view. If it's night time, I'll walk back towards the center to go catch the subway. I'll hear Fado (traditional Portuguese music) guitars playing in the restaurants and groups of people gathering for dinner. There are many restaurants to pick from as you walk the streets, and many hosts and hostesses trying to get your attention. On days when it is not late, or I have gone there earlier in the day, I'll keep walking as the exploring isn't over. Chiado also hosts the Museu de Arte Contemporanea. I have only been there twice, but I've loved it both times. The contemporary art museum, and almost all museums, are free on the first Sunday of each month, the reason why I've only been there twice. Located closer to the shops and on the opposite side of my metro exit, it hosts a great collection of Portuguese contemporary aritsts, as well as rotating painting and photography exhibits. My favorite part one day was walking down the long white hall way which hosted beautiful paintings. I've realized during my time here, that I love the work many artists were producing in the 1950s. I don't know why, but I keep being attracted to those the most even if I don't know anything about the piece. These artists were searching for simplicity. Things that they were doing that were considered going beyond the norm are things that I take for granted today. Since I'm sharing about museums, located 10 minutes (driving) down the river, you can find the MAAT, Museu de arte, architectura y tecnología. Its a large museum located in the old electric company. 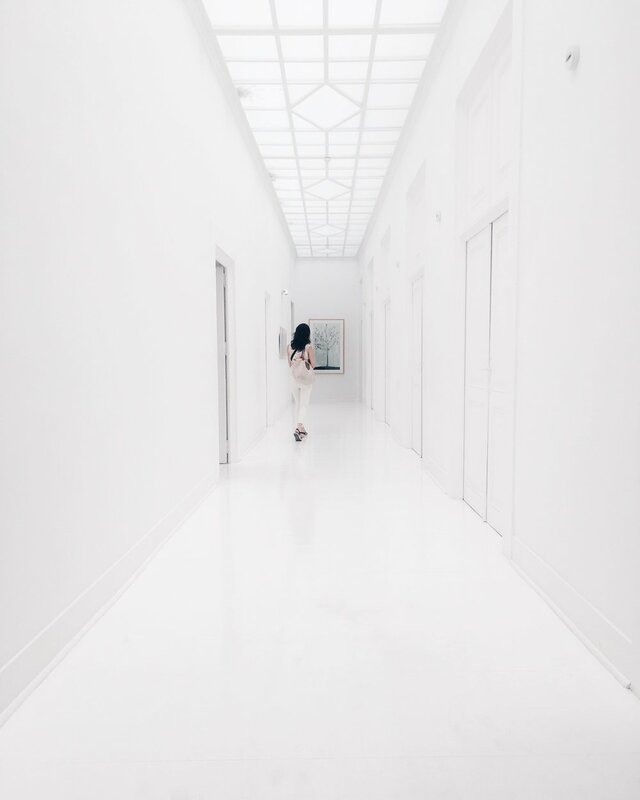 They recently opened a new building, with beautiful white walls. The building will host several expo rooms, and has a similar feel to the Tate Modern in London. Another favorite (not located in Chiado, but closer to Parque Eduadro VII) is Fundacao Gulbenkian (image above). I talked a bit about it in my last blog. 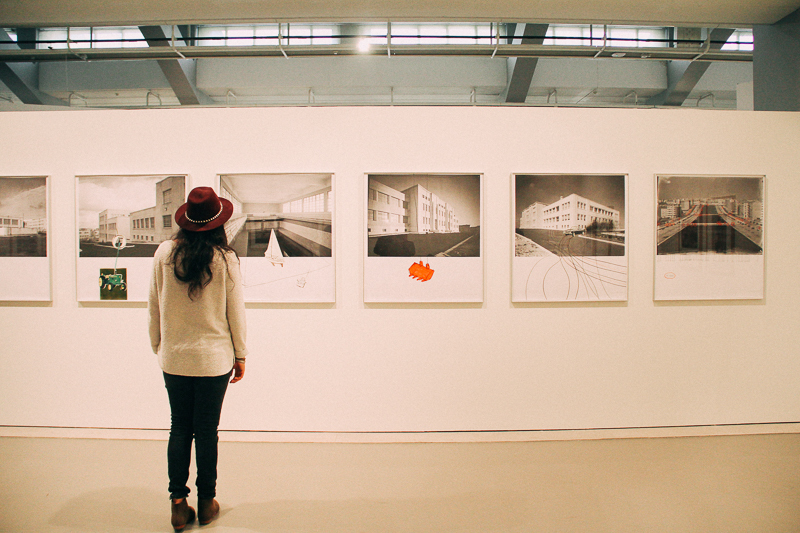 It has two art museums, but I especially enjoyed the Modern one. Iconic design by Charles and Ray Eames, hosted at MAAT. Back to walking through the dowtown (don't worry I'll probably do one post just on art museums), on my way to see Rio Tejo. My first stop is Praca do Comercio. Every tourist must go here, but my favorite part is listening to the street musicians across the plaza. People gather to hear them as their music bounces off the sound of the waves of the Rio Tejo. It is a lively scene with dancing, and Caribbean influenced beats and rhythms. After listening for a while, I keep walking on the sandy banks to find one of the coolest artists I've seen. I don't know his name, but this man is playing with rocks all day (essentially a child at heart). He creates sculptures, but the times I've seen him work it reminds me of God as a creator. One day I saw this man work and the light was perfect. Soft sun beams hit the left side of his face as I saw him pick out specific rocks to keep adding to the tower. It reminds me of playing with dirt and pine needles in between the pine trees at my school I grew up back home. I keep walking down the river. I have one more stop: another one of my favorite coffee shops. (Yes I know, I spend lots of money on coffee, I need to work on that addiction...) Montana Lisboa. Before arriving I people watch, the sun is being tucked away in the background. For a second I'm transported to San Fransisco, a city I went to in May, but I keep walking as I watch friends, couples, families all gather near the water to seal the day and welcome the night. I love watching the people gather by the river. They are there for the sole purpose of looking at the river, having a chat and finishing the day. Some meet up for a glass of wine or coffee. I would think that people who spend that much time contemplating at nature would realize that someone way bigger and more creative made all of it. 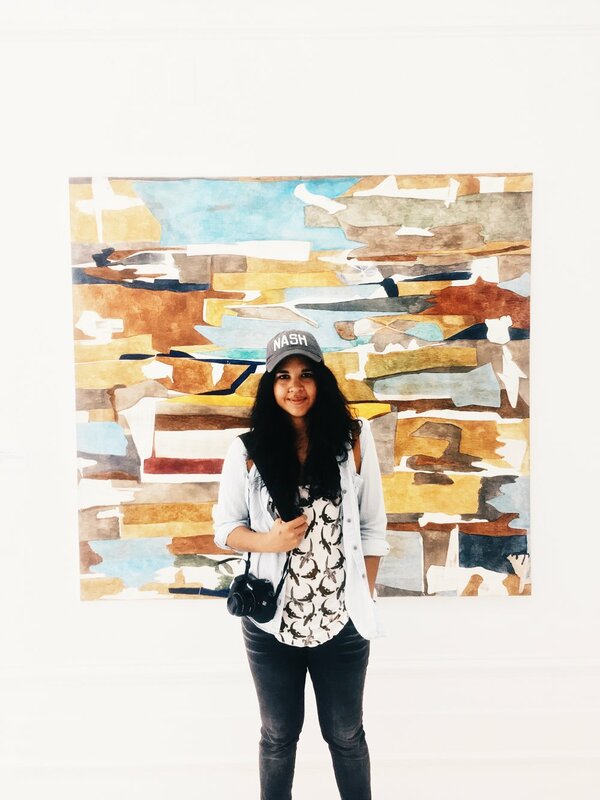 Everywhere I go I see sneakers, jean jackets, and flat billed hats. Obviously, there are others who dress differently, but the sub culture of an urban youth is fascinating to me as they all look the same (myself included). Thank you social media, we are now all a part of a massive group think. Nonetheless, I'll still like looking at cool shoes. I arrive to Montana Lisboa, they have a broader coffee menu, so I get something a little fancier than a meia leite. This is a coffee shop, but it is also an art print store, and a spray paint store. I love the way they designed it. They also have the cheapest acrylic paint, so it is here that I bought the beautiful colors for my new collection. I don't mind that long walk down the river jsut so I can arrive at the paint store. It was here that I was also introduced to a new friend: the spray paint marker....it stinks (smell wise). Lisbon has street art all over the city, another source of inspiration for me. So how could I take this home with me, how could I channel that into my paintings? The street artists use this pen to sign their names on their work and let it drip to give it more grit. This marker has made an appearance on several of my new pieces and I love it. Basically, within this tiny radius, I've experienced the old world, gone to fun art museums, contemplated life from amazing spots, seen the sunset and the river. 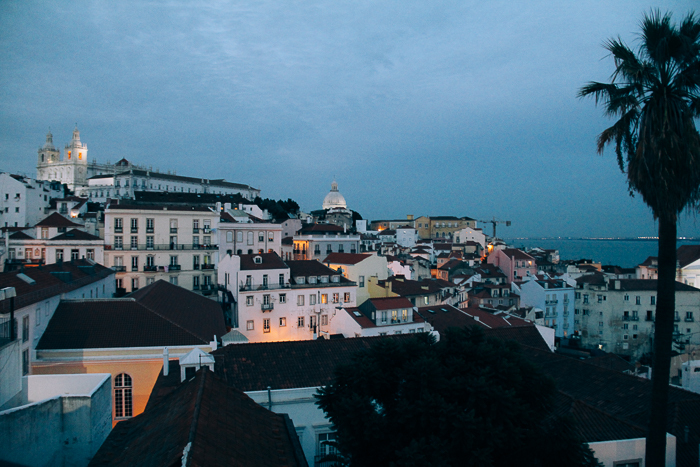 I hope you a little more details of my explorations of Lisbon. Up next on the blog: more night photography and some of my favorite portraits/street portraits. You might like these posts as well.